The Arewa community in Lagos State has endorsed the state’s All Progressives Congress (APC) governorship candidate, Mr. Babajide Sanwo-Olu to be elected as the next governor, reports ITREALMS. While also addressing the crowd, Dr. Hamzat urged members of the group to reject the candidates of the main opposition party- Peoples Democratic Party (PDP) - which, he said, destroyed the country for 16 years. 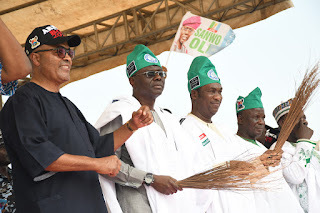 Pix: L-R: Former Minister of Interior and Leader, All Progressives Congress in Lagos State, Senator Demola Seriki; APC Gubernatorial Candidate in Lagos State, Mr. Babajide Sanwo-Olu; his Running mate, Dr. Obafemi Hamzat and Chairman, Arewa Community in Lagos State, Alhaji Mohammad Dandama Yabo and Seriki Hausa in Lagos, Alhaji Abdullahi Gafar, during a campaign rally and formal endorsement of Mr Sanwo-Olu, by the Arewa Community in Lagos, at National Stadium, Surulere.